MANAGUA, Aug 1 2014 (IPS) - Víctor Sánchez doesn’t want gold or the comfortable future income he was promised. He just wants to live the life he has always lived on his farm along the Banks of the Las Lajas river – but the river is slated to become part of the route followed by the Nicaragua Interoceanic Grand Canal. Sánchez, a 59-year-old small-scale farmer from the southwestern department or state of Rivas, told IPS that he isn’t familiar with the details of the mega-project that the government touts as the ticket for this country to lose its dubious status as the second-poorest in the Western Hemisphere, after Haiti. He is worried that he will be removed from the land where he has always lived with his extended family, and that he won’t receive compensation for his property. That’s what he told representatives of the HKND Group at a Jul. 15 meeting in the International University of Agriculture and Livestock in Rivas. HKND is the Hong Kong-based Chinese company that was granted the concession to build the canal. 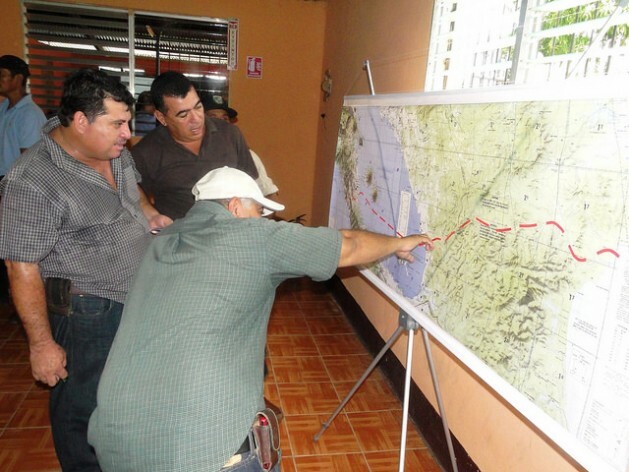 The Chinese technicians, with the support of interpreters and Nicaraguan officials, provided details of the ambitious project to a local audience in the city of Rivas, the departmental capital, 110 km south of Managua. The canal will connect the Pacific and Atlantic oceans by means of a 278 km waterway, which includes a 105 km stretch across Lake Cocibolca. The numbers involved are impressive: the canal will cost 50 billion dollars to build and will be up to 520 metres wide, with a monimum depth of 27.6 metres and a maximum of 30 metres. An estimated 5,100 vessels a year will make the 30-hour crossing through the canal. Pang Kwok Wai, assistant director of HKND’s department of construction management, explained that the work is set to begin in December in the municipality of Brito, in Rivas, on the Pacific coast. The department will be split in half by the canal and part of the local population will be relocated. The project will create a city of 140,000 people on the Pacific side of the country. A 29 sq km duty-free zone will also be established in Rivas, along with four tourist complexes, an international airport with warehouse capacity for thousands of tons of cargo, a deepwater port, giant bridges and other “sub-projects” in the terminology used by HKND. In June 2013, the government of leftwing President Daniel Ortega granted the concession for HKND Group to build and run the canal for 50 years, extendable by another 50 years. The government argues that the canal will definitively transform the economy of this Central American nation, where 42.5 percent of the population of 6.1 million lives in poverty and 70 percent of jobs are in the informal economy. Telémaco Talavera, the president of the National Council of Universities and a member of the Special Commission for the Grand Canal, told IPS that to carry out the work, large industrial companies will be created that will require local labour power: 50,000 direct jobs during the construction phase and 200,000 permanent jobs after 2019, when the canal is to be completed. HKND also announces the construction of new cement, steel, dynamite, asphalt, fuel and energy plants. The Nicaraguan government estimates that as a result of the construction work, GDP growth will accelerate from the current four-five percent to 10.8 percent in 2014 and 15 percent in 2015. The government projects that GDP will climb from 11.2 billion dollars to 24.7 billion dollars in 2018. HKND Group, led by the mysterious Chinese businessman Wang Jing, has given the world the impression that the project is a sure thing, from its news releases. But doubts about the company, and especially about the fund created to finance the canal, are far from being cleared up. The company says it hired the China Railway Construction Corporation to carry out the technical feasibility studies, the U.S. McKinsey & Company for the information analysis and the UK-based Environmental Resources Management consultancy for the social and environmental impact assessments. HKND technical experts have repeated in public and private meetings in Nicaragua and China that the company invited businesspeople from China, Russia, the UK, the United States, Germany, Belgium and Australia to support the project. The canal has raised hopes among thousands of Nicaraguans for a more prosperous future, according to two national surveys. One of the pollsters, MyR Consultores, found in a July poll that 31.3 percent of respondents thought the canal would bring benefits to a smaller or greater extent. Another survey, by the Americas Barometer of the Latin American Public Opinion Project at Vanderbilt University in the U.S., presented in Managua this month as well, found that 72.8 percent of those interviewed stressed the generation of jobs by the canal as a potential benefit. But 43.4 percent of respondents were worried about the environmental effects that the project could have. That fear is shared by dozens of environmentalists and non-governmental organisations, like the Nicaraguan Foundation for Sustainable Development, which under the leadership of biologist Jaime Incer, environmental adviser to the president of Nicaragua, is opposed to the construction work with the argument that it will irreversibly affect Lake Cocibolca. The lake is the biggest in Latin America: 8,624 sq km of freshwater. According to the organisation’s estimates, the construction of the canal would affect 400,000 hectares of jungle and wetlands. Incer told IPS that Nicaragua gave HKND authority over the lake and surrounding areas, which include more than 16 watersheds and 15 protected areas representing 25 percent of the country’s rainforest. HKND Group has not yet completed its environmental impact studies. Nevertheless, it has already decided on the route to be followed by the canal, as well as the construction of a 400 sq km artificial lake and 41 giant deposits along the route to store the earth that is removed. Another aspect criticised by opponents is the lack of transparency surrounding the project’s financing. Detractors have not received any response to their questions about who is financing the project and how they operate. The company and its executives in Nicaragua, as well as the Nicaraguans in charge of the project, have avoided revealing the identity of their sources of financing. “The fund is guaranteed, but it is confidential; these matters are business secrets, especially because of the companies that trade on the stock market,” said HKND’s Pang. Talavera, with the Special Commission for the Grand Canal, told IPS that the important thing at this time is to explain to the population the reach of the mega-project and to guarantee that it brings benefits for the country. “The details about the financing will be provided when the time is right, if the financing partners decide on that,” he said. The country’s refusal to reveal information about the partners and the origin of the funds has given rise to speculation. For example, opposition lawmaker Eliseo Núñez has insinuated that the Chinese government is behind the project – a suspicion that Wang Jing has consistently denied. Would the people wish to remain among the world’s poorest or be lifted from poevety like 600 million Chinese. This environmental talk is often rubbish put forward by US-led NGOs who wants to keep the rest of the world poor so that the US can continue to be the Master. Hasn’t Nicaragua suffered already enough from US hegemony which has been keeping its people being one of the most deprived in the world? This environmental talk is what we breath, eat and drink. If you ever been in a big Chinese city, you would appreciate the basic life this farmer wants to live. Money doesn’t makes you happy. “Money doesn’t makes you happy”. Nor does abject poverty! Exactly… better watch out for dictators disguised as environmentalists..
the rights of making canal in Panama from French..